Spectacular condo in Riverside, the Bentley Award winning complex. The finest address in Costa Rica. American quality high-end finishes plus beautiful views of the Central Valley and Poas Volcano. Pets Market – large pet store with good selection of pet foods,grooming aids, and toys. Veterinarian and grooming available in store. Captivating mountain and central valley views are part of your condominium experience as are attractive landscaped tropical gardens. An elegant Club House will make your special occasions even more special! Safety and security are high on the list of priorities. Your high-rise condominium will be protected 24 hours by uniformed professional security guards. An integrated fire protection system helps ensure safety. Building access is restricted by electronic gates and communication via intercom. 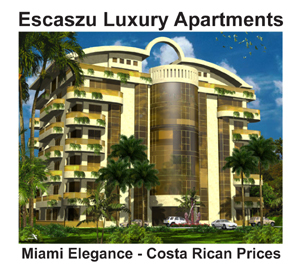 Escazu, an exclusive suburb 2 miles west of San Jose, is by far, the fastest growing housing infrastructure in the metropolitan area. Well known for its pleasant climate and exuberant vegetation, property values are among the highest in Costa Rica, making it one of investor's top favorite spots. Due to its proximity to prestigious schools, medical centers, office complexes and restaurants, it has a direct daily influence on 605,000 people; therefore, there is major business presence in this fashionable area. Riverside is located just 800 meters from Escazu's "Milla de Oro" (Golden Mile) and "El Cruce", within walking distance to many commercial venues and fine restaurants. Multiplaza Mall, Cima Hospital, Pricesmart, Office Depot, EPA Home Center, and Plaza Itskazu which has 9 restaurants including Outback Steakhouse and Hooters.